1, The numerical number of the batching instrument just displayed a maximum or minimum number, zero setting doesn’t have any reaction, and the scale body without reaction of adding and subtracting weight. At this time, we can confirm that the sensor lines are wrong or the sensor is damaged. You should rewiring the lines or replace the sensor. 2, The weighing number of the concrete batching machine is nonlinear, inaccurate or unstable. We can conform that the reason is machinery; Sensor sensitivity is incorrect or inconsistent, we can conform that the adjustment of the batching instrument is wrong. At this time, you should make mechanical adjustment or replace the sensor, then carefully set zero again and check the steelyard. 3，The air compressor of the concrete batching machine can’t start . Button is poor contact; thermal relay hop. Check or replace the button; and readjust the thermal relay to protect the current. Some action of the automatic position continues to exist. The batching instrument s output 14 core plug have short-circuit phenomenon. 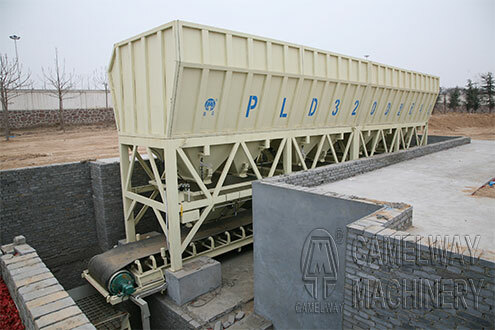 Check the 14 core plug of concrete batching machine. 4，The last discharge door does not open when automatically unloading. The setting numbers are not appropriate. You should reset it. The air switch of electric source can’t be closed. The wiring in the electric control cabinet is wrong; you should power off and check the wiring. Batching instrument without display, you should check the power supply insurance and power socket of the batching instrument of concrete batching machine. Turn off the electric air switch of the motor or solenoid valve. .5，There is short circuit in external . Check the external line. If there isn’t any action no matter the manual or automatic. The electrical control cabinet wiring line of the concrete batching machine is lost. In this case, you should check the wiring in the electric control cabinet. As a professional concrete batching plant producer, Zhengzhou CamelWay Machinery has produced concrete batching equipment which can satisfy your different requirements. If you are interested in the concrete mixing equipment, please feel free to contact us. This entry was posted in Solution and tagged concrete mixing station by camelway. Bookmark the permalink. How to build a karoo environmentally-friendly batch plant?